Size-fractionated major and minor particle composition and concentration. Size-fractionated particles were collected using McLane Research in-situ pumps (WTS-LV) that had been modified to accommodate two flowpaths (Ohnemus and Lam, 2015). Typically, two casts of 8 pumps each and two filter holders per pump were deployed to collect a 16-depth profile. At superstations, three casts were deployed to collect a 24-depth profile. The wire-out was used to target nominal depths during deployment. A self-recording Seabird 19plus CTD was deployed at the end of the line and used to verify target depths. Filter holders used were 142 mm-diameter “mini-MULVFS” style filter holders with two stages for two size fractions and multiple baffle systems designed to ensure even particle distribution and prevent particle loss (Bishop et al., 2012). One filter holder/flowpath was loaded with a 51um Sefar polyester mesh prefilter followed by paired Whatman QMA quartz fiber filters. The other filter holder/flowpath was also loaded with a 51um prefilter, but followed by paired 0.8um Pall Supor800 polyethersulfone filters. All filters and filter holders were acid leached prior to use according to methods recommended in the GEOTRACES sample and sample-handing Protocols (GEOTRACES, 2010). QMA filters were additionally precombusted at 450 deg C for four hours. Each cast also had a full set of “dipped blank” filters deployed. In the first half of the cruise, these were the full filters sets (51 um prefilter followed by paired QMA or paired Supor filters) loaded in mini-MULVFS filter holders that were mounted on a pump with a specially designed dipped blank plate to accommodate two extra filter holders not connected to the pump. A 0.2 um Supor prefilter above the filter set excluded any particles that may have been present in seawater in the filter holder headspace. At station 21, the specially designed plate (along with the filter holders) was lost at sea when the ship lost power, so subsequent dipped blank filters were the full filter sets sandwiched within a 1um polyester mesh filter, loaded into acid-leached perforated polypropylene containers, and attached with plastic cable ties to a pump frame, and deployed. All dipped blank filters were exposed to seawater for the length of the deployment and processed and analyzed as regular samples, and thus functioned as full seawater process blanks. A total of 58 dipped blank filter sets were collected and used for blank subtraction and determination of uncertainty and detection limit (Table 1). In this dataset, data reported from the 51um prefilter are referred to with a LPT suffix to indicate large particulate total concentrations (>51um); data reported from the main filters (QMA—1-51um—or Supor—0.8 um-51um) are from the top filter of the pair only, and are referred to with a SPT suffix to indicate the small particulate total concentrations. For all parameters described below, the median dipped blank value (Table 1) was subtracted. For most parameters, we could not routinely run replicates, so the reported error is determined from the standard deviation of dipped blank filters (Table 1), converted to concentrations using volume filtered. This assumes that the blank subtraction is the largest source of error. The detection limit was defined as three times the standard deviation of the dipped blank filters. Values below the detection limit were flagged as QF=4. The percentage of all samples that fell below the detection limit is listed in Table 1 for each parameter and size fraction. Any variations on the methods for blank subtraction or determination of error are further described for each parameter, as necessary. A 1/16 subsample of the top 0.8um Supor filter, equivalent to ~30L, or of the 51um polyester prefilter above the QMA filter, equivalent to ~60L, was analyzed for amorphous/biogenic Si concentrations using spectrophotometric detection of the blue silico-molydate complex following an alkaline (0.2M NaOH) leach at 85 deg C. Some initial stations were run manually on a Shimadzu UV-2550 UV-VIS Spectrophotometer at WHOI, but most samples were run on a Lachat QuikChem 8000 Flow Injection Analyzer at UCSC. The principle of both methods is the same, except that formation of the silico-molybdate complex reaction is allowed to run to completion before spectrophotometric detection in the manual method (WHOI), whereas the reaction occurs online in the flow injection method (UCSC). A time-series approach was tested for the WHOI leaches, with four timepoints taken after 1, 2, 3, and 4 hours of leaching. There was little evidence of a systematic lithogenic contribution, so the mean of the first three timepoints from the WHOI leaches was taken as the most representative value, and the standard deviation used in the error estimate. Subsequent samples at UCSC were leached for 1 hr only. Intercomparability of the WHOI and UCSC methods was assessed by checking that the bSi profiles of stations with samples analyzed at both places were oceanographically consistent. The median of Supor dipped blank filters were used to correct the SPT data. For >51 um LPT samples on polyester prefilters, blank corrections were made using the median failed pump values (pumps that never turned on, or that shut off after <5% of programmed water volume was filtered) because of anomalously high prefilter dipped blank values. Anomalously high prefilter dipped blank bSi values was also observed for the GA03 NAZT section. The reported error was determined as the standard deviation of bSi on the dipped blank filters, converted to concentrations using volume filtered. 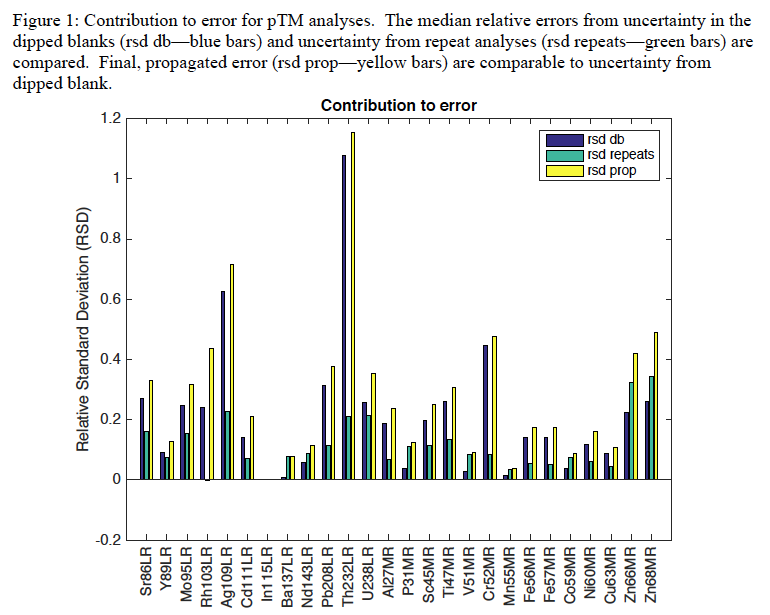 For samples run at WHOI only, the standard deviation of the three timepoints was also propagated into the error estimate. Particulate organic carbon and particulate nitrogen were measured by combustion on an elemental analyzer after fuming with concentrated HCl to remove particulate inorganic carbon. Briefly, dried filter samples were exposed to HCl fumes in a dessicator for ~16 hours. After fuming, filters were dried at 60 deg C in an oven for another ~16 hrs before being pelletized in tin discs. POC from suspended particles (1-51um; SPT) were measured using a Flash EA1112 Carbon/Nitrogen Analyzer using a Dynamic Flash Combustion technique at the WHOI Nutrient Analytical Facility on two 12 mm-diameter punches from the top QMA filter, representing the equivalent of ~20L of material. For the >51um size fraction (LPT), particles from the 51um polyester prefilter above the Supor filter were rinsed at sea with 1um-filtered seawater onto a 25mm 1.2 um Sterlitech Ag filter and dried at 60 deg C. Half of the Ag filter containing rinsed LPT particles, typically representing ~200L of material, was analyzed for POC and PN using either a Carlo Erba 1108 or a CE Instruments NC2500 elemental analyzer interfaced to a ThermoFinnigan Delta Plus XP isotope ratio mass spectrometer at the Stable Isotope Laboratory at UCSC, which also gave the C and N stable isotope composition of the LPT particles. Intercomparability of the WHOI and UCSC datasets was assessed by checking that a POC_SPT profile that had samples analyzed at both places was oceanographically consistent. For POC and PN in the small size fraction, the standard deviation of 47 dipped blank QMA filters used for blank subtraction. For POC and PN in the large size fractions (>51 um; POC_LPT, PN_LPT), we found that the variability in the dipped blank increased significantly after station 21 (i.e., after the loss of the dipped blank plate and switching to the perforated plastic holder for the dipped blanks), especially for the deeper casts. We therefore use the median and standard deviation of 25 dipped blanks from before station 21 for blank subtraction and error estimation (Table 1). The stable isotopic composition of C (δ13C) and N (d15N ) for the large size fraction LPT particles are given as raw values (*_raw), and corrected for the dipped blank (*_dbcorr) using the median isotopic composition of the dipped blanks (Table 1). Measurement precision is 0.2 permil for samples greater than 20 mg C (1.7 mmol C) or 20 mg N (1.4 mmol N). Only three samples did not meet this threshold for LPT C, but 77% of LPT samples did not meet this threshold for N. d15N values for samples below the 20 mg N threshold were assigned a QF=4. Particulate organic matter (POM) is calculated from POC using a weight ratio of 1.88 g POM/g POC (Lam et al., 2011). Intercomparability of the WHOI and UCSC datasets was assessed by checking that a PIC_LPT profile that had samples analyzed at both places was oceanographically consistent. Blank subtraction, error calculation, and detection limit determined as described at beginning of section 2. 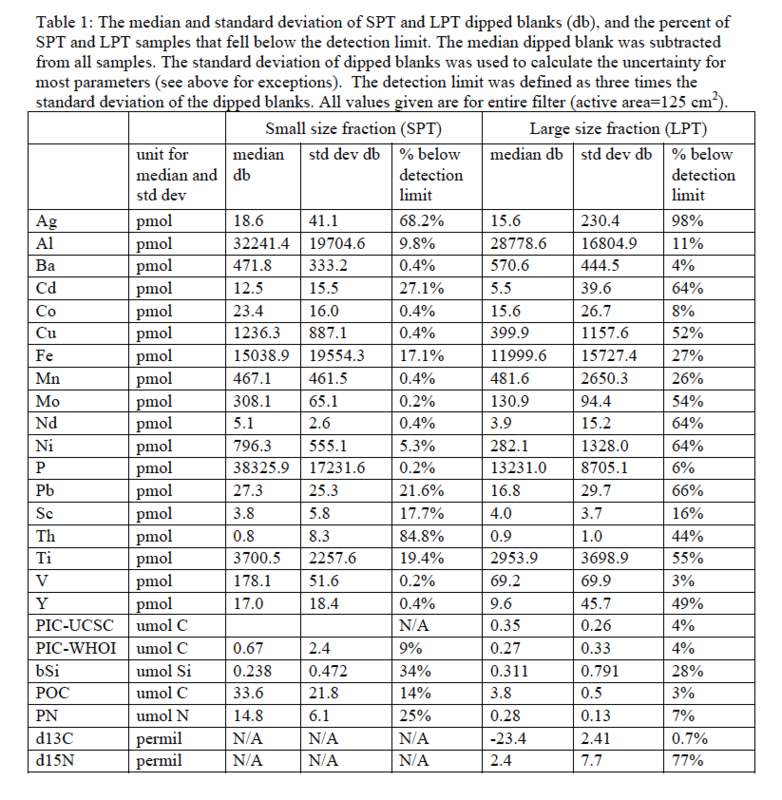 Total pTM concentrations in the SPT were analyzed from either 1/16 or 1/8 subsamples of the top Supor (0.8um) filter. pTM totals in the LPT were analyzed from 1/8 subsamples (typically ~150L) of the QMA-side 51um pre-filter, which were rinsed at sea onto 25mm Supor (0.8um) filter discs using 0.2um-filtered surface seawater collected using clean techniques from an underway Fish system (Bruland et al., 2005). Methods for particulate trace metal (pTM) digestion and analysis followed those described in (Ohnemus and Lam, 2015). Briefly, the Supor filter matrix was first completely digested with the strongly oxidizing Piranha solution, a 3:1 mixture of sulfuric acid and hydrogen peroxide with 1 ppb Rh as a recovery monitor. After drying down, remaining particles were digested in a mixture of HCl/HNO3/HF acids (all acids at 4 M) at 135˚C for 4 hrs, then dried down. Remaining pellet was reacted with 50% HNO3/15% H2O2 to remove any remaining organics, dried, and resuspended in 5% HNO3­ with 1 ppb In as an internal standard for analysis via high-resolution Inductively Coupled Mass Spectrometetry (HR-ICP-MS) using an Element-XR ICP-MS (Thermo Scientific) with SC-FAST (Elemental Scientific) sample introduction system and PC3 Peltier cooled quartz cyclonic spray chamber in the UCSC Plasma Analytical Facility. ICP-MS (Element XR, Thermo-Finnigan). Elemental concentrations were standardized using multi-element, external standard curves prepared from NIST atomic absorption-standards in 5% HNO3­. Instrument drift and matrix effects were corrected using the internal 1ppb In standard and monitored using a mixed element run standard. Concentrations were determined using external standard curves of mixed trace elements standards. 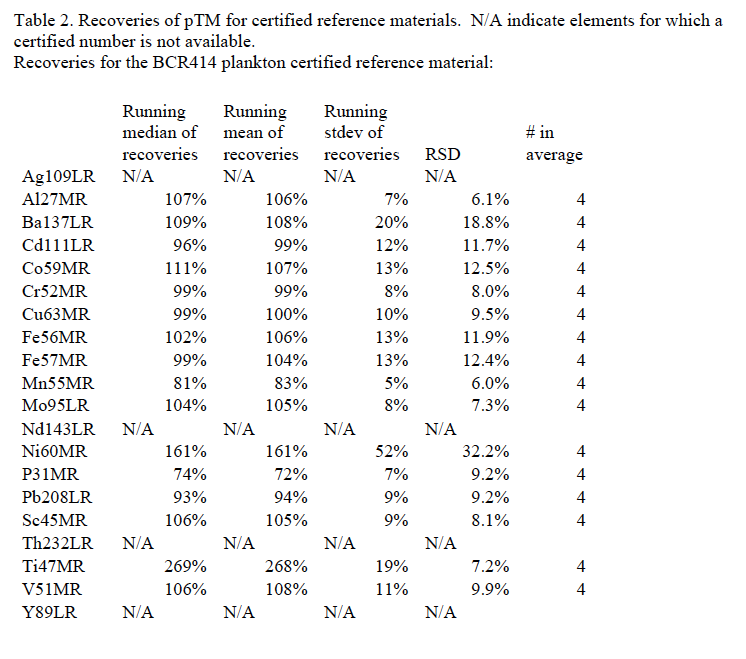 A subset of samples were repeated in which samples were redigested and/or rerun. The reported error is calculated by propagating the two main sources of uncertainty: uncertainty in the dipped blank subtraction, and the combined uncertainty due to heterogeneity in particle distribution and variations in digestion. The former is determined as the standard deviation of the dipped blank filters. The latter is determined from the maximum of the mean relative standard deviation of all repeat samples for that element if no repeats were run, and the actual standard deviation if repeats were run. For most elements, the uncertainty in the blank subtraction was the largest source of uncertainty (Figure 1). Al is usually used as a tracer of lithogenic material since it is the third most abundant element in Earth’s crust after Si and O. Al has the added advantage that its concentration does not vary much between upper continental crust (UCC Al = 8.04% by weight) and bulk continental crust (BCC Al = 8.41wt%), so the estimate of lithogenic mass is not very sensitive to lithogenic source regions (Taylor and McLennan, 1995). Slopes of Fe vs Al (10.3 mol Fe/mol Al) and Fe vs Ti (0.23 mol Fe/mol Ti) for samples dominated by lithogenic material (Station 1 trench) gave slopes that were very similar to UCC crustal ratios (Fe/AlUCC=10.0 and Fe/TiUCC-0.21; compare to Fe/AlBCC=11.2 and Fe/TiBCC-0.41). We therefore use the UCC Al concentration of 8.04% to calculate lithogenic mass. Fe and Mn in oxyhydroxides were calculated by subtracting Fe and Mn associated with lithogenic material. Although Ti may be a better tracer for lithogenic Fe and Mn than Al as the ratios of Fe and Mn to Ti are less sensitive to source than ratios to Al (Lam et al., 2015), Ti concentrations were very low and often below the detection limit for this transect. We verified that the UCC Fe:Al=0.210 mol/mol and Mn:Al=0.00355 mol/mol ratios (Taylor and McLennan, 1995) compared well with Fe:Al in the most lithogenic-rich sample in our dataset—the deepest samples in the Peru Trench, which had Fe:Al=0.227. We thus used the UCC ratios of Fe and Mn to Al to remove lithogenic Fe and Mn, We approximate the formulae for Fe and Mn oxyhydroxides to be Fe(OH)3 (ferrihydrite approximation) and MnO2 (birnessite approximation), with formula weights 106.9 g Fe(OH)3/mol Fe and 86.9 g MnO2/mol Mn, respectively. Negative numbers were set to 0. Note that the resolution of this data is dictated by the lowest resolution of the component parts. Blank corrections, error calculations, and detection limits are described above with analytical methodology. 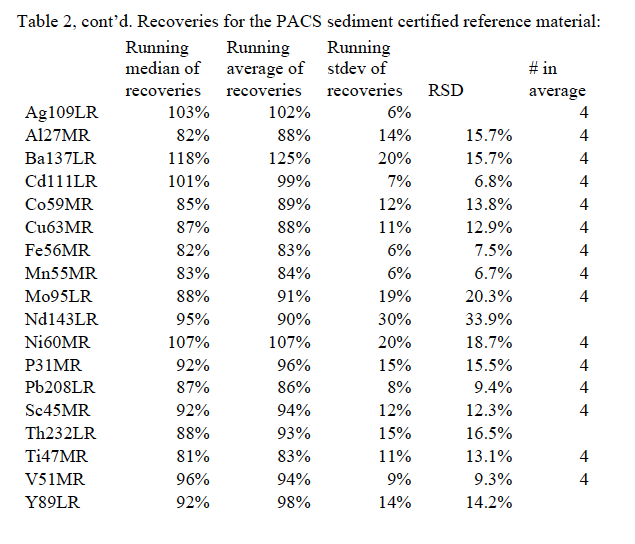 Lab quality control (QC) included running standard reference materials for pTM (BCR414 and PACS-2—see table 2), participation in intercalibration exercises, comparison of pTM profiles with Go-Flo pTM data (Sherrell/Fitzsimmons/Twining/Ohnemus), and checks for oceanographic consistency. For barium (Ba_SPT_SPT_PUMP_CONC and Ba_LPT_PUMP_CONC), profiles shapes were sometimes strange in the middle water column (~500-2000m), diverging significantly from generally more oceanographically consistent Go-Flo pTM data. We suspect the occasional precipitation of an insoluble Ba mineral in our digestion procedure. For Ba, we’ve threfore assigned QF=4 to all samples, and further assigned QF=8 to samples in which we most strongly suspect a problem. -Reformatted column names to comply with GEOTRACES and BCO-DMO standards. -Replaced all blanks, "NaN", "#N/A", and "#VALUE!" with "nd". -version 01/03/2017: error in small size fraction (SPT) particulate trace metals for station 3. Correction affects most SPT parameters for station 3. -version 01/24/2017: corrected ISO_DateTime_UTC for events 4013 and 4150. GEOTRACES, 2010. Sample and sample-handing protocols for GEOTRACES Cruises, in: Standards and Intercalibration Committee (Ed. ), 1.0 ed. A unit that accurately determines the carbon and nitrogen concentrations of organic compounds typically by detecting and measuring their combustion products (CO2 and NO).